Sigh. . . No diary entry again. I know that the end of the diary is near, and I am relishing these last few days of A Hundred Years Ago. As the diary winds down and we send Grandma off to live the rest of her life—and me off to a new blogging project,–I’ve been thinking about some of the mementos of Grandma’s that I’ll continue to see on a daily basis. As I mentioned a few weeks ago, Grandma passed shortly after I got married; and, when the grandchildren were given an opportunity to select items they would like to have from her house, I selected practical items that I needed. One item I selected was Grandma’s ironing board. Another item I chose was her fruit bowl. It has sat on my kitchen counter, generally filed with a bunch of bananas (or a few pears or plums), for more than 30 years. I’ve lived in several different homes across that time period, but the fruit bowl on the kitchen counter has been a constant. The fruit bowl is so functional (yet beautiful)—and I seldom even think about its history—but it’s kind of nice that items that once were Grandma’s are part of my home. The past and the present all somehow merge. Posted on December 28, 2014 December 26, 2014 by SherylPosted in OtherTagged family history, genealogy. Yes. You must share the history with them! I love that bowl! It is so pretty! It is pretty–yet very sturdy. I’m not sure what kind of glass it is, but I’m thinking that it is some sort of depression glass. I can understand why you cherish that bowl as a memento of your grandmother. Many of us too are feeling bittersweet as your blog comes to a natural conclusion…you’ll see out the old year and welcome in the new one with the end of one blog and start of another! It’s a really weird feeling as the diary ends, and this blog comes to its natural conclusion. I’m surprised how much I think I’ll miss it–though I’m very excited about the new blog. It’s a beautiful bowl, and nice that it’s traveled with you over the years. I’d much rather have something old (especially something with sentimental value) than anything new! Me, too. . . almost everything in my house has a story behind it. And you also somehow acquired this wonderful diary of her earlier years! That is a prize in itself. Thank you for sharing her life with us! Sometimes being practical also ends up being a wonderful aesthetic choice! This touch of elegance and simplicity from a hard farm life, passed on to you, is just perfect! I love how you describe the fruit bowl. You’ve described it–and the reasons I like it–perfectly. I’m glad you liked the photo. I always like to have some fresh fruit in the kitchen. I love that fruit bowl. It is both practical and beautiful. Your words in the first paragraph hit me. You are reaching the end of the diary…yikes! Yes, enjoy every moment and maybe revisit them…along with her treasures. Happy New Year Sheryl. The time sure has flown. Have a wonderful New Year! You are fortunate to have the family photos. You can learn so much about individuals from looking at photos. You and your grandmother have given us such a gift. 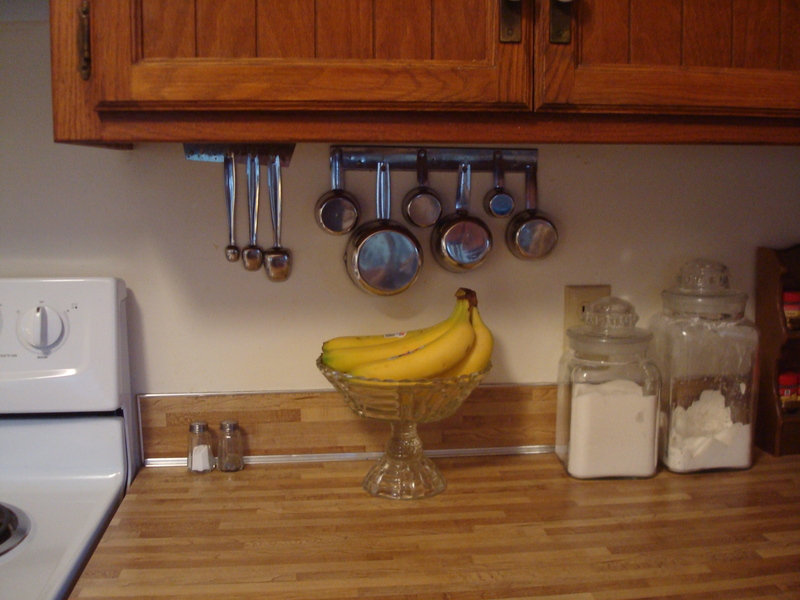 I’m glad to see the banana filled fruit bowl — a solid, living memento. You describe the fruit bowl very nicely. One of the things that I really like about the bowl is that it is very sturdy (and not fragile). I never have to worry about accidently breaking it. It’s a lovely reminder when you think about it having been your grandmother’s fruit bowl, and after 30 years it’s not surprising that you might take it for granted that it’s always there. You’d be lost without it though, I’m sure. They did have pretty glassware, always in use, like your fruit bowl. I like how the old glassware was both pretty and practical. I have my grandmother’s aluminum strainer I use often. I also have my other grandmother’s T shirts and a lipstick. I have the T shirts because she lived in a cold climate and we lived in a warm one. Everytime I would visit her, she would have to let me borrow her undershirt to keep warm. All of her undershirts were willed to me. Ah, Grandma is still keeping me warm. What a great story! I used to hate undershirts when I was a child–now I don’t have any, but am often cold and would probably appreciate them. How sweet that something so practical brings happy memories of Helena. It is nice to surround ourselves with personal items. The older I get, the more my house is filled with items that hold meaning to me. same here – Happy New Year! It’s a beautiful bowl. It’s wonderful to have an heirloom that is functional and in sight where you can enjoy it everyday. In some ways it’s a unique type of heirloom in that it is both functional and beautiful. My house (and my closet) are full of family items. From my grandfather’s moth-eaten childhood blanket and Bible to an outfit from Mom with the tags still on it, I have pillowcases with tatting from my grandmother and throw pillows needle-pointed by Aunt Edie. Some items stay folded away because of their fragility, while others, like your fruit bowl are an everyday mainstay. The older I get, the more my house contains items that once belonged to ancestors and other relatives. There’s something special about each item–though I think that the ones that become everyday mainstay tend to be my favorites. How wonderful that you have those things and use them. Many times people keep those items in a special place, but never use them. All the things I have from my Mom I love using, especially at special occasions like birthdays, Christmas, or other special days. I also love using the items I have that once were Grandma’s or other relatives. Beauty and functionality are a nice combination.